As is obvious, Casper Van Dien reprises his role as Johnny Cage. The "Johnny" chest tattoo and "Cage" belt directly reference the design introduced in Mortal Kombat (2011) [full story]. 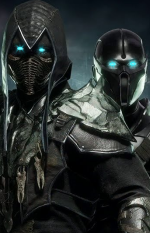 The same look was featured recently in a WWE Immortals crossover, and as an alternate skin in Mortal Kombat X. Other photos from the set show MKX inspired designs for Scorpion and Erron Black. Rumored to be called Mortal Kombat X: Generations but unofficially known as Legacy 3; the series was completed last August, and at one-time scheduled for "early" 2016 release [full story]. Its exact status is currently in limbo. Catch up on all the news and major stories from the third live-action series in MK Online's Information Hub. Register to discuss all things webseries and movie in the Media & Merchandise forum! Help spread the word by liking stories via @MK_Online and Facebook. the series was completed last August, and at one-time scheduled for "early" 2016 release. I like the fact Van Dien has enrolled in MK franchise. His portrayal of Cage has been rather decent, at least more so than Mullins's. Plus, the fighting game-based movies seem to be his kind of genre, as I generally don't value his acting CV much, nor his skills. Funnily, I was thinking his now former wife, Catherine Oxenberg, would make a fine Sindel or Sonya. Her playing Sindel would be a bull's-eye for a number of reasons, her half-royal pedigree being one of them. But then, she lacks Sindel's penchant for fighting, and she's too old to start taking lessons. The jackasses at Machinima recently set the entire second season to "private" on YouTube. Idiots. What a completely bizarre case study this is. Why would they film this and then halt release, or possibly post production, for who knows how long at this point? By the time it comes out (if ever) it will have lost all momentum. What's the hold up with this? Wasn't this meant to tie in with the release of MKX? I'm afraid by the time this comes out- if it ever does- it'll be too little too late. <div class="forumQuote"><b>ProfesserAhnka Wrote:</b><br/>What's the hold up with this? Wasn't this meant to tie in with the release of MKX? I'm afraid by the time this comes out- if it ever does- it'll be too little too late.</div> <br/> <br/>Agreed. <br/> <br/>Only way I see this mattering to people anymore is if there is a HUGE DLC release that warrants a lot of attention. Only way I see this mattering to people anymore is if there is a HUGE DLC release that warrants a lot of attention.